Homeownership in the U.S. has fallen sharply since the housing boom peaked in the mid-2000s, though it’s declined more for some racial and ethnic groups than for others. Black and Hispanic households today are still far less likely than white households to own their own homes (41.3% and 47%, respectively, versus 71.9% for whites), and the homeownership gap between blacks and whites has widened since 2004. An examination of mortgage-market data indicates some of the continuing challenges black and Hispanic homebuyers and would-be homebuyers face. Among other things, they have a much harder time getting approved for conventional mortgages than whites and Asians, and when they are approved they tend to pay higher interest rates. In 2015, 27.4% of black applicants and 19.2% of Hispanic applicants were denied mortgages, compared with about 11% of white and Asian applicants, according to our analysis of data gathered under the federal Home Mortgage Disclosure Act. In fact, throughout the boom, bust and recovery phases of the housing cycle, blacks have been denied home loans at higher rates than most other racial groups (the exception being Native Americans, and even then only in the last few years), and Hispanics have been denied at higher rates than non-Hispanics. The reasons lenders cite for turning down mortgage applications show different patterns depending on racial or ethnic group. Among whites, Hispanics and Asians rejected for conventional home loans, for instance, the most frequently cited reason was that their debt-to-income ratio was too high (25%, 26% and 29%, respectively). Among blacks, the most often cited reason was a poor credit history (31%). Even if denial rates had remained constant far fewer blacks and Hispanics would be receiving home loans, because mortgage applications from those groups have fallen dramatically. In 2015, for example, only 132,000 blacks applied for conventional loans, down sharply from 1.1 million in 2005 (the peak year overall for conventional home-purchase mortgage applications). Today’s applicant pool not only is smaller than before, but its racial and ethnic composition is different too. In 2005, for example, nearly 10% of conventional mortgage applications came from black households; in 2015 less than 4% did. Hispanics comprised 14% of all applicants in 2005 but less than 7% in 2015. 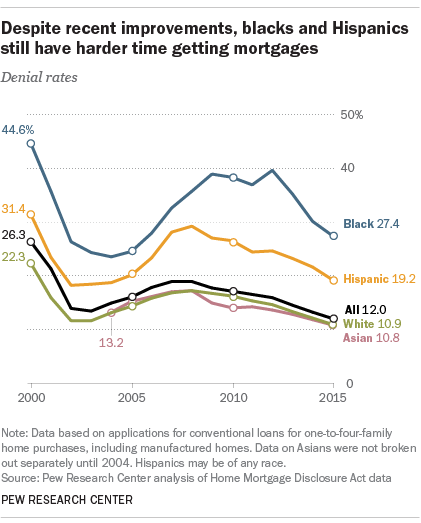 In all, application volume for conventional mortgages fell 69% overall between 2005 and 2015, but the drop was 88% among blacks and 85% among Hispanics, versus 66% for whites and 57% for Asians. Blacks and Hispanics generally put less money down on houses relative to total value than other groups. 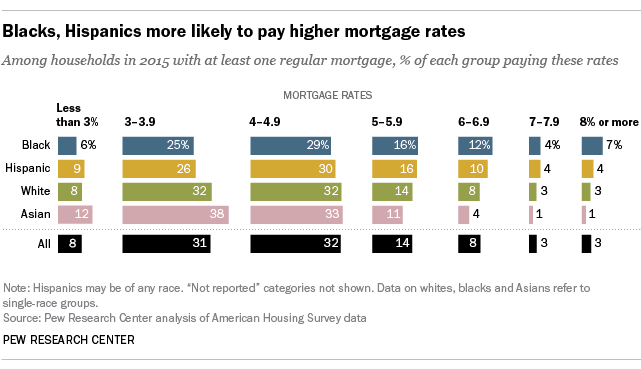 According to a separate analysis we did of 2015 data on mortgage-carrying households from the American Housing Survey, more than half of black and Hispanic householders reported making down payments equal to 10% or less of the property’s value, versus 37% of whites and 31% of Asians. On the other hand, around a quarter of white and Asian households reported down payments of 21% or more, versus 12% of blacks and 17% of Hispanics. Lower down payments often translate into higher mortgage rates, and all else being equal, higher rates make homeownership less affordable because they increase the amount of a borrower’s monthly income devoted to his or her mortgage payment. Our American Housing Survey analysis found that blacks and Hispanics do tend to pay higher rates than members of other groups. In 2015, fewer than two-thirds of black and Hispanic householders had mortgage rates below 5%, compared with 73% of white householders and 83% of Asian householders. By contrast, 23% of black householders and 18% of Hispanic householders with mortgages were paying 6% or more on their home loans, compared with 13% of white householders and just 6% of Asian householders.